Recently I purchased a craft book at Joann's about cloth dolls. 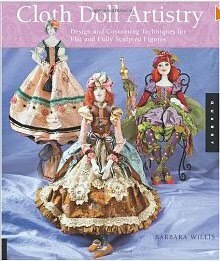 I had not been thinking of making dolls, I just saw this book cover and fell in love. It is written by Barbara Willis and published by Quarry Books. I must have read it 5 times before I began. It is one of those books that is inspiring just to look at, at least for me it is. 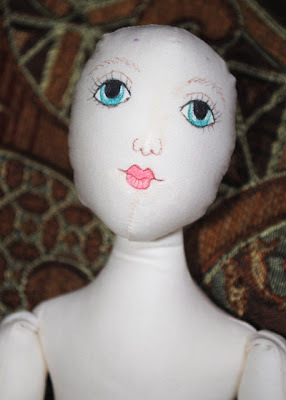 Barbara has three different dolls you can make, starting with easy, then the one I chose and there is also one that has a sculpted face (much harder). 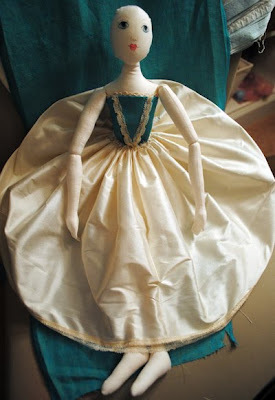 I am happily up to my ears in fabric and lace working on my "Marie" doll. I still need to add makeup and shading. It was "interesting" painting on a round soft surface! Her bloomers are made of a delicate fine lawn. The blue in the background is the material I am using for her dress. It is not actually this green, but more blue. 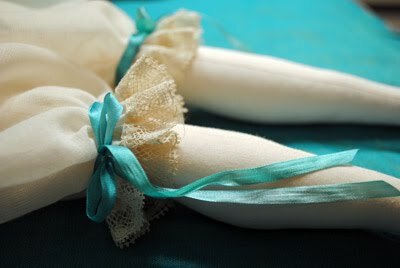 I finished them with a fine silk ribbon. Here she is with the first part of her bodice. I have used trimmed vintage lace on the turquoise silk linen fabric. And her underskirt is made of gorgeous Duponi silk, trimmed with more vintage lace. Today I am working on her over skirt and her sleeves. I have ordered Tibetan Goat hair for her head from Barbara. I hope it will arrive this week. Marie does not enjoy being bald! Thank you for stopping in. I hope you are all doing very well today. I so appreciate you taking the time to come by and comment. She is going to be so great!! Beautiful face and you did an excellent job on her hands!! Oh I really love her Terri! 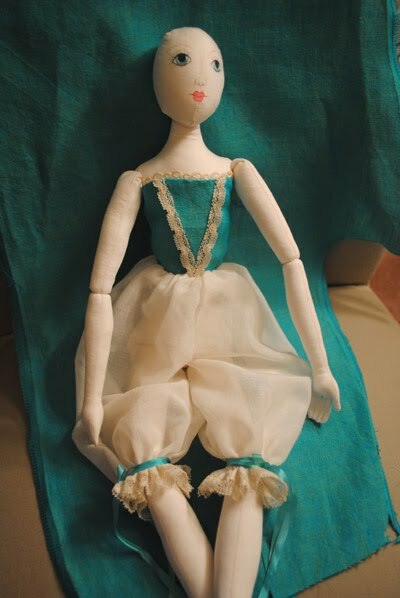 I also got inspired by the magazine "Prims" to try making some dolls and although they are on hold right now(other projects took priority)I am loving the process too! I would love to know how to order the Tibetan Goat hair if you could add a link as I am not to the hair part yet. Thay book must be marvelous.I love that kind of dolls . Oh wow, she looks so great and you just did a fantastic job! Way to go! I can't wait to see her when she is all dolled up! Oh my, she's looking gorgeous. Amazing that you should see the book and be so inspired, I love how different we all are..
She's on her way to becoming fabulous! I've enjoyed seeing each step of the way..can't wait to see the over skirt and sleeves. ooo i am very impressed, she is lovely. 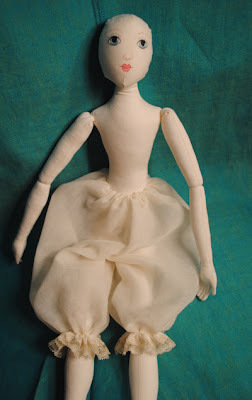 I have a few cloth doll books, but have only made one so far...must make more! That book was a great find, and your little darling is gorgeous already so I can only imagine how breathtakingly beautiful she'll be when finished. Terri, she is turning out beautifully! I can't wait to see her finished! Terri, I don't blame you at all for reading the book over and over again! The costumes on the cover are enchanting! I can see why you want to try your hand at making them. She's beautiful so far. You did great turning those slender pieces! 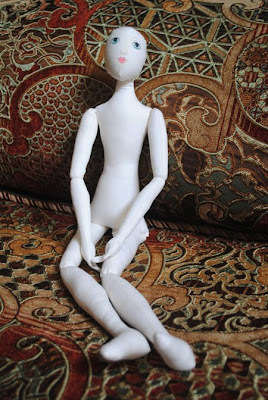 You are creating a beautiful doll. Love her face and her clothes are gorgeous. Can't wait to see the next step. You are such a talented "artiste"
WOW Terri she looks amazing and the hands are SUPER! oh to ba able to make some thng like this I'm in awh of you yet again. SO talented! Terri, she is truly amazing, her face is just beautiful. Hope you are having a great summer. Wow I am so impressed with you!! How fun! ~Shelley O.
Terri, what a beautiful doll. 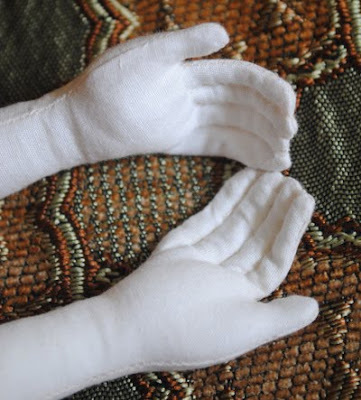 Those hands are so cute and I can see how much work it was to sew them. But turned out wonderful. And so nice to see how you dress her. I am curious what will follow and how she looks with the hair. WOW WOW WOW - ain't she a grand ole dame (Marie not you)! LOL You are doing a marvelous job with this doll. You never cease to amaze me with your talents! Hugs! You've got an incredibly wonderful weblog. To become a prosperous man or woman the fundamental factor would be to have positive thinking. Appreciate Sky Rocketing Accomplishment with Turbo charged Positive Affirmations... Develop Positive Thinking So You may Get rid of Strain From your Life, Boost Your Self-Confidence and Plan Yourself For Lifetime Good results!